The Dillon Amphitheater renovation is almost complete. The town of Dillon has announced it will be ready to host bigger shows and crowds by July 2018. One of the biggest names on the new venues list is the Colorado jam band, The String Cheese Incident. With views of the Tenmile and Gore range as its backdrop, the Dillon Amphitheatre was already a summertime favorite for locals. The renovation and recent improvements will house bigger and better acts. The upgrade of the Dillon Amphitheatre began in the fall of 2017. It will feature a larger dance floor, new restrooms and a couple hundred more seats for concertgoers. The Amphitheatre’s grass seating area has stayed the same though the grade has been minimized. More seats have also been added since the venue has been pushed closer to the lake. The venue remains in a bowl shape, curving around the stage but has been upgraded to be more ADA friendly. Before the upgrade, there was no official green room and no loading or unloading space for musicians and their gear. When multiple artists or groups played in the past, their equipment was stored behind the stage on the dirt. The upgrade allows for new bathrooms and green rooms for bands. There are now also concession stands and a festival plaza at the top of the amphitheater. The festival plaza will have food trucks and local street vendors from the Summit County area. Another upgrade/addition includes adding an extra couple hundred guests — roughly 3,650 people in total. The ambition of upgrading the space was never to make it bigger, but to increase the flow of the facility and make it more accessible for all. Even with all of the updates, the Dillon Amphitheatre remains an intimate venue. Bands don’t know the Dillon Amphitheatre as a bucket-list venue — yet. 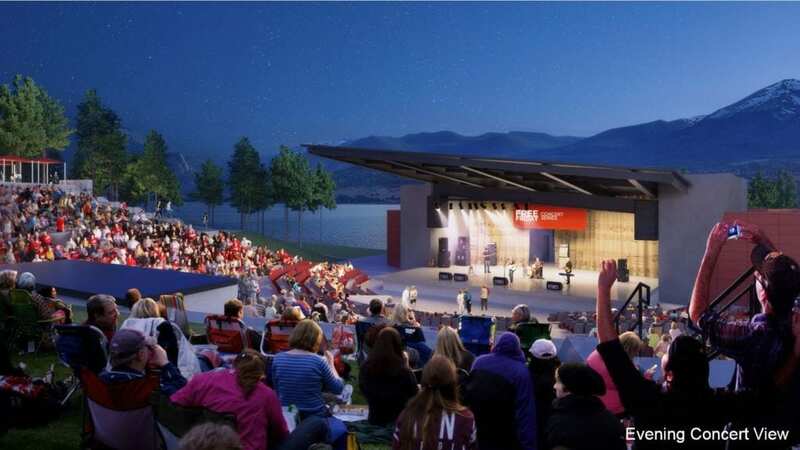 The Dillon Amphitheatre could become the next Red Rocks-like space, but only time will tell as Dillon continues to develop its new venue. Once there is a better understanding of its flow and capacity, it’s likely more major attractions will be announced in the near future. When the Town of Dillon reached out to The String Cheese Incident and included the plans of the new venue and the views, they were blown away. With how quickly The String Cheese Incident sold out, it seems locals are excited about future engagements. The String Cheese concerts will be a true test to the new venue. Free shows will continue to be a staple in Dillon. However, the town is looking to bring in a series of bigger name acts that will be paid concerts to complement the free music throughout the summer. From String Cheese to Broadway show tunes, the Amphitheatre’s lineup shows the extent of offerings for entertainment. To view the lineup of concerts, visit TownOfDillon.com and click on events. Renovations should be completed no later than the middle of June. The town of Dillon is looking to establish the Dillon Amphitheatre as one of the best outdoor facilities in the nation!